Fight tooth decay, gum disease and calm tooth pain with these easy home remedies. Canker sores/gum care: Calendula benefits gums with its antiviral, anti-inflammatory, and immune-stimulating compounds. Tincture of goldenseal and other herbs with berberine can be applied directly for infections, canker sores, and ulcers of the mouth. Myrrh tincture or as a wash is good for spongy gums. Turmeric powder mixed in warm water has been a used as a home remedy for cancer sores for some time It has many medicinal properties such as anti-inflammatory, antioxidant, and antimicrobial activity that could explain why it is a useful dental and oral care treatment. Decoctions of willow bark tea can be used as a gargle to treat inflamed gums. Neem leaf powder can be used as an effective tooth powder to fight plaque and gingivitis when mixed with astringent herb powders and/or baking soda. A few drops of Tea tree oil on a clean wet toothbrush and applied to the gums with a cotton swab helps sensitive teeth and receding gums. Fight tooth decay Cocoa contains antibacterial agents that fight tooth decay. This fact will not overcome the fact that it cocoa is often prepared with copious amounts of sugar. Cranberry extracts have also shown promise in the prevention of tooth decay. Research suggests that gum arabic may be useful as a chewing gum to prevent dental plaque. Cardamom is perhaps the best source of cineole, a strong antiseptic that kills the bacteria responsible for bad breath and tooth decay. The FDA has approved bloodroot for use in commercially available toothpastes and oral rinses to inhibit the development of dental plaque and gingivitis. Be aware though bloodroot in the raw state is poisonous and root juice is corrosive. 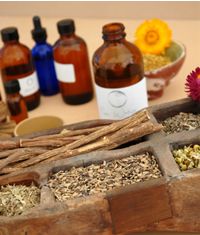 Clove oil is virtually pure eugenol, a powerful, multifaceted phytochemical that anesthetizes and kills bacteria. 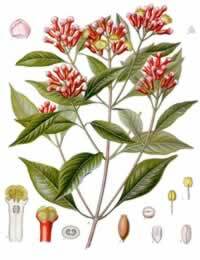 Clove oil has been used for generations to relieve pain from toothache Another good essential oil to have on hand to fight tooth infections and toothache is Thyme . Ear and tooth pain are not always from the same causes, but they both seem to aggravate the other. A pillow of warm Hops will often relieve toothache and earache. Mullein oil is another classic ear oil, two or three drops of this oil in the ear 2 or 3 in the day. Garlic oil is also another good antibacterial oil for ear infections that can be made easily at home.